An application cannot be uninstalled using Software Center when it contains more than one deployment type. I recreated the same scenario in SCCM RTM version and the uninstall button is available even with 2 DT. I have submitted the bug to Microsoft through the connect portal, I’ll be following on this bug in this post. Update Nov.18: Microsoft has acknowledged the bug and are now working on a fix. Update Jan.09 2014: Microsoft has confirmed that this issue will be fixed in CU1. It is planned to be release Q2 2014. 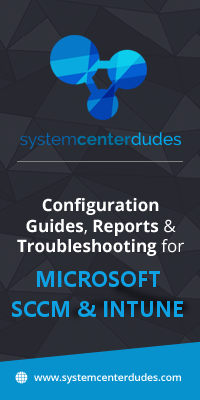 Update Mar 28 2014 : Microsoft has just release CU1. This CU fix this issue. The Uninstall option may not be available in Software Center for applications that are made available through multiple deployment types. For example, if two deployment types for an application apply to a client, and if both have an Uninstall action, the Uninstall button is unavailable. It appears that this problem either still isn’t fixed, or has re-surfaced with CU4. I’ve applied CU4 to my server (HKLM\SOFTWARE\Microsoft\SMS\Setup\CULevel is 0x00000004 (4)) and the client-side update (version is 5.00.7958.1501), and any Application that has multiple Deployment Types (e.g. Flash Player which has both NPAPI and ActiveX control versions) cannot be uninstalled. Thanks for the heads up! I don’t think the issue was ever really fixed to begin with. I was going to apply CU4 but I think I will wait as it appears to exacerbate the issue. I did some more digging and spoke with a peer whom has been using SCCM much longer. It appears that this is working as designed. If an application has multiple deployment types or has dependencies, the uninstall option is greyed out. Looks like mountains of vbscript on the horizon! I have this problem with single deployment type applications. I’ve got about 48 applications now and I can uninstall all of them. I’m on CU5 as well, now. Yes. I have updated all clients with CU 1, CU 2, and CU 3 and I am still having an issue. 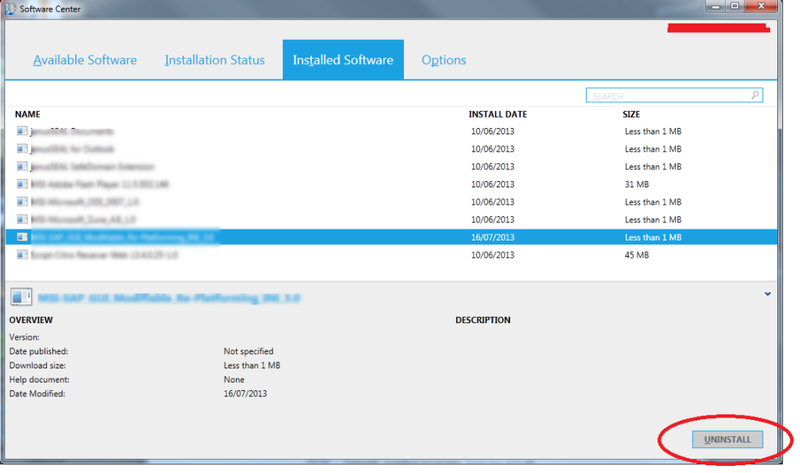 If an application is showing on the Installed Software or Installation Status tabs by itself, the uninstall button will not be available. If I install another application just to get it to list on either tab, then I can toggle to bring the button back to life. This happens with either a single or multiple deployment type application (Note: We will not be supporting as many 32 bit machines as we have in the past, so most of our applications will be 64 bit from this point on). Has there been any movement towards a resolution to this issue? Official statement from Microsoft is that it’s fixed in CU1. You’re still facing the issue even if your client are updated ? I am still facing the issu after CU3 update. I am still having this issue after CU2. I have deployed the CU2 client to all workstations and my applications have well defined uninstalls. This issue is not limited to applications with multiple deployment types. All client policies are polled and updated, if necessary, once an hour every day. We installed CU1 in August, giving the system ample time to update all clients. Uninstalls are well configured and worked perfectly before the R2 upgrade. We are actually seeing the same thing. We have CU1 and this happens with new clients and old clients across various applications. It seemed to have started in the past few weeks. I wonder if some kind of patch to Windows is causing an issue. CU1 has NOT fixed this issue. The uninstall button is still unavailable. Are there other options? Verify that your application is well configured with an uninstall program line. Do you applied CU1 to both your site server and clients ? Yes, CU1 was applied about two months ago and the client update deployed successfully to all clients. Toggling between installed applications does not make the uninstall button available when there are more than one deployment type. I was struggling with the same issue but a rollback to ConfigMgr Client 5.00.7804.1300 solved the problem.